With the villain in Quantum Of Solace looking like an insurance salesman with no eyelids, Movie-Moron has decided to complete its 46 years of research (starting when Dr. No came out) into the top 10 very best James Bond villains. Mr. Wint and Mr. Kidd are a duo of assassins working on behalf of Blofeld. They’re sadists, who talk in proverbs and finish each other’s sentences. Innuendo also suggests the pair are actually a homosexual couple, not that there’s anything wrong with that. They manage to put Bond in a coffin, have him cremated and bury him in a pipeline underneath the desert – not bad for a day’s work. 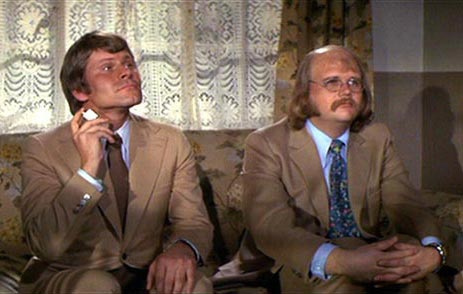 The reason Blofeld was dropped down a chimney at the start of “For Your Eyes Only” was because Cubby Brocolli was involved in a legal case with Kevin McClory. McClory owned the copyright to the film “Thunderball”, which included SPECTRE and the Blofeld character. So Brocolli, in the world’s greatest “screw you”, had Bond finally kill his arch-nemesis in order to prove that the character could survive without his baddie. McClory later produced 1983’s “Never Say Never Again”, which is the same film as “Thunderball”. “Red” Grant in FROM RUSSIA WITH LOVE. The coolest part was he was played by legendary badass Robert Shaw (who would soon go on to play yet another badass — Quint from JAWS). The final fight in a cramped train compartment, although more low-key than expected from a Bond film, is none the less one hell of a showdown. Sean Bean is the MAN!!! Either Zorin or Carver are the best. How could you forget the ladies: Xenia Onatopp and Fatima Blush! How is Emilio Largo not on this list!? Great list! although I think Red Grant and Necros should have been squeezed in … they were rather menacing! along with Odd Job and Jaws they proved to be pretty ruthless. I believe Goldfinger was a great villain but wasn’t exactly super menacing/scary – but he was very deceitful! How about that shady golf contest? Good list – I’ve always thought Karl Stromberg was well acted. intimidating,comfortable in his abilities,ruthless ,cold and guy who you KNOW could kill you quite easily. for me i think the great villain that Bond fought is Kananga. it is a nice film live and let die. Bond is struggling to win with those VOODOO people. Trevelyan would have been right at the top of my list; Blofeld would have probably fallen to third. Second would have to be Zorin, fourth would be Goldfinger, and fifth would be Carver. Le Chiffre is for me the number one.The acting of Mads Mikkelsen is perfect and fits the story exactly.I always thought that Max Zorin was a good match for Bond,an insanely clever Walken,even though i realize there are many negative opinions. Logically,Bardem directed by Mendes will vaporise them all!